In Canada, primary care-focused health IT company Premier Health acquires EHR and RCM vendor Cloud Practice for $5 million. The Virginia Department of Behavioral Health and Developmental Services will implement Cerner Millenium at its 13 facilities. Chesapeake Health Care, an FQHC based in Salisbury, MD, decreases patient check-in time by 50 percent after implementing kiosks and software from Clearwave. 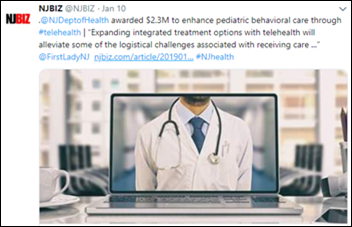 The New Jersey Department of Health will use a $2.3 million grant from HRSA to develop the Family-Centered Mental Health Access Program, which will provide telemedicine access to pediatric primary, behavioral, and mental healthcare through the state’s Pediatric Psychiatry Collaborative. 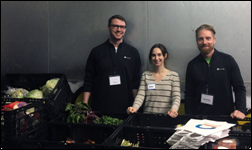 Organized by Hackensack Meridian Health and Cooper University Hospital, PCC works with PCPs to help refer patients to the most appropriate services. 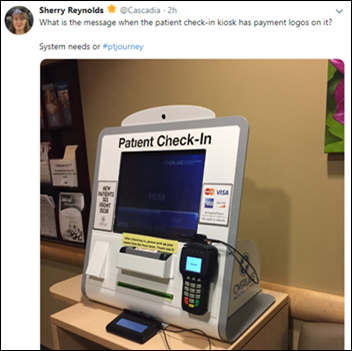 @Cascadia’s observation is an apt one, though one could argue that physician practices are operating on razor-thin margins these days, and can’t afford not to be blatant about their need for prompt payment.